GrowthOps Blog is writing on the Svbtle network. operations into growth operations. During this time we have been blessed to have been joined on our journey with a band of committed colleagues who are helping us work on this transformation and we have also been fortunate that our customers have given us this opportunity. What is Growth Ops? It’s a question that we have encountered in almost all our engagements and this post is about defining Growth Ops. increasing role specialization at every touch point of the customer engagement process from campaign to renewal. As such, the days of meeting your growth targets by deploying an army of salespeople are behind us, we are looking to grow with the deployment of special forces with targeted operating procedures to help scale. As with any special forces, more roles mean more orchestration which in turn demands a finely tuned backend logistics machines which helps make the process repeatable and scalable. At fullcast.io we believe good intentions don’t scale, good processes do. I am yet to meet a salesperson who does not want to meet their target, yet most sales teams do not attain more than 60% of quota. Think about it 40% of your sales team will not meet their target. The problem is getting worse, as per the 2017 Bridge group report sales productivity is dropping year over year. Looking at the Bridge group report, Sales leaders have to ask the question why throwing people and tools on the sales operations space is not leading to more productivity? We will discuss our approach to automation versus the “hire more people and buy more tools” approach in a separate post. Sales Operations is about doing things right. Growth ops is about doing the right things. The mission of a sales operations team is to make the running of the sales team smooth. They are focused on driving efficiency in the process. Growth Operations is about tying not just the sales team but the pre-sales -sales and post-sales function with top line CXO objectives about growth. It’s about making the process become efficient but in context of shifting CXO priorities. Sales Operations is about execution, Growth Operations is about transformation. Just making a process efficient by itself cannot be the end goal. Process efficiency on its own means nothing if the process itself is not be being continuously monitored for tweaks. If you have a process that is not evolving with your organization, making it efficient only means you will be missing opportunities more efficiently. At the end of the day, the purpose of sales is to help a company grow. Growth depends not just on a company’s ability to generate revenue but also on its overall profitability and predictability of the revenue stream. Growth requires all functions of marketing, sales, service and product to align. This is where Growth ops differs from Sales Operations. Growth operations takes a top-down view of the company’s goals and evaluates the enforcement of process and policy across the campaign to renewal cycle and uses metrics to provide a feedback loop that helps business become more agile in their ability to meet their customer needs. Help you do iterative sales planning for finding your optimum coverage model for teams, territories, products and channel partners in support of the growth metrics. We put together this framework to help connect the CXO team goals with the objectives of the teams engaged with the customer and the operations team working in the backend. This framework allows us to ensure that companies looking to grow are able to keep their entire organization that has an impact on revenue in sync. Sales Operations is no longer working in a vacuum disconnected with the top line growth aspirations need of the organization. Are we growing is predictably? reinvest your profits back into the company to fund growth, but you cannot claim that revenue generation alone is your goal. The “Perform” row in blue, then takes the goals of the Growth aspirations of a company and influence the goals of marketing, sales and post sales. Are we growing through acquisition of new accounts? Are we / what is our growth through expansion in current accounts? Are we optimizing our pipeline with the right types of accounts that match our current ICP? As your company will grow your ICP will change or multiply. These questions help you reframe your growth strategy for meeting the top line growth objectives. Do we have the right roles? Do we have the right coverage model? Is our compensation plan aligned to meet the growth goals? answer the key growth questions. Devoid of this framework that drives a top-down view, the sales operations teams end up working in bottoms up mode. Looking at the organizational goal from the bottom makes the charter of the sales operations team look like an endless game of whack a mole. 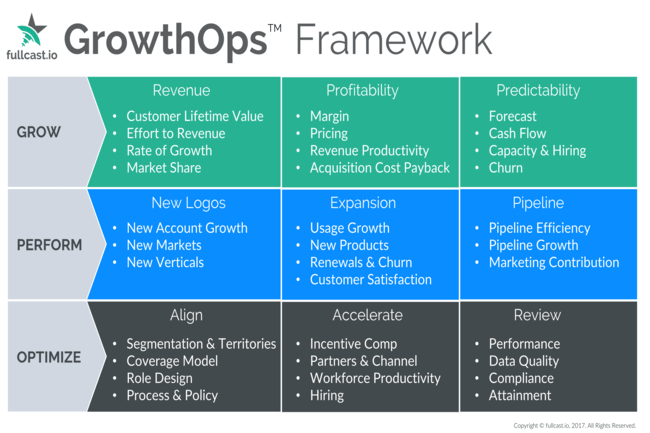 The Growth Ops framework helps organize the unorganized mess that can be sales operations. Think Growth Ops, not Sales Ops. Sales operations as we have mentioned above is about doing things right to help you grow. Growth Ops is, however, about not just doing things right but also ensuring that you are doing the right things. It’s what will help you outperform your peers who are all deploying the same sales processes to help them scale. All things being equal, the company that can tie its Corporate Strategy to its daily execution rhythm will outperform a company that is looking to operate efficiently but in silos. Your customer does not engage with you in silos, your company should not be engaging with your customer in silos. If you have any feedback on this framework, we want to hear from you.